As a new prime minister takes office, the country faces a host of challenges. 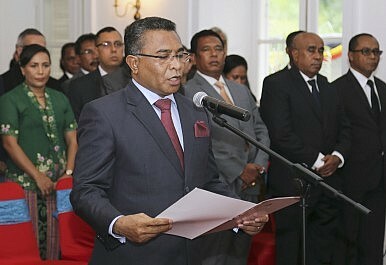 On Monday, Rui Araujo was sworn in as the new prime minister of East Timor. A former health minister and physician from the country’s opposition party, he replaces Xanana Gusmão, who served as the country’s first president after East Timor gained independence from Indonesia in a bloody independence battle, and more recently as prime minister. Gusmão stepped down to make way for a new generation of leaders, including members of the political opposition, to facilitate the formation of a new unity government. Araujo has the potential to usher in a new period of cross-party cooperation as East Timor faces a host of critical challenges, including the need to address widespread poverty, unemployment, corruption, and an array of human-rights challenges. Additionally, Araujo also inherits a host of issues related to the country’s 1975-1999 violent conflict with Indonesia, including the legacy of killings, enforced disappearances, sexual violence, torture, and war crimes – most unprosecuted. Though rich in natural resources, East Timor remains one of the world’s poorest countries with about half of its 1.2 million citizens living in poverty. High inflation, unemployment, and heavy reliance on gas revenues still plague the country. East Timor’s poor economic development is largely due to years of protracted conflict with Indonesia; according to the World Bank, decades of violence destroyed nearly seventy percent of the country’s buildings, homes, and school and approximately 75 percent of the population was displaced. Currently, oil and gas account for 80 percent of the country’s GDP and 93 percent of its exports. Using revenues from gas, Gusmão’s government established a sovereign wealth fund in an effort to diversify the country’s economy and promote more widely distributed economic growth. If Araujo hopes to push the Timorese economy to its fullest potential, it is essential that it expand this fund and ensures that it is used to back projects that contribute to diversified revenue sources. This is particularly crucial and time-sensitive, given that the country’s most significant source, the Bayu Undan oil and gas field, is projected to be exhausted by 2024. East Timor also faces some of the highest unemployment in the world. The International Crisis Group previously estimated that 71 percent of the available workforce is either unemployed or informally employed. In light of these ongoing challenges, Araujo’s government needs to focus on improving infrastructure, strengthening human capital, and developing new growth in industries such as tourism. The government should also concentrate on expanding efforts to work with multilateral institutions such as the World Bank and the United Nations, which have assisted in strengthening the country’s economy. In addition to addressing East Timor’s economic challenges, Araujo’s government must work to address corruption, which is endemic in the country. Transparency International ranks East Timor 133rd among 138 countries in its 2014 Corruption Perceptions Index, a composite index based on corruption in the public sector. Bowing to public concern over corruption, in 2010, Gusmão appointed the country’s first anti-corruption commissioner. Araujo’s government needs to expand these efforts to reform the country’s culture of corruption by ensuring that the anti-corruption commission has the unconditional support of the government. It should also adopt the OECD anti-bribery convention, to which seven non-OECD member countries have signed on. The human-rights situation in East Timor is equally troubling. Principal human-rights concerns include the use of excessive force by police, arbitrary arrest and detention, gender-based violence, and an inefficient and understaffed judiciary system that deprives citizens of a fair trial. Notably, in October 2014, Timor’s parliament and government acted to dismiss and expel all international judicial personnel and advisers working in the country’s justice sector. Given the importance of international support in helping to develop a competent and independent Timorese judiciary, this move, which was criticized by the UN Special Rapporteur on the Independence of Judges and Lawyers, represented a serious interference in the judiciary. While East Timor has every reason to want to build its own effective institutions, there are numerous ways in which international experts can and should be allowed to assist in justice sector reform. Araujo must also deal with the inherited legacy of a host of past human rights-abuses committed by Indonesian security forces during East Timor’s struggle for independence. Little progress has been made in addressing crimes against humanity and other human-rights violations carried out during this dark period in the country’s history. The mandate of the UN Serious Crimes Investigation Team expired in December 2013, with approximately 60 investigations into outstanding human-rights violations left uncompleted due to insufficient resources. Further, the Timorese government failed to implement recommendations of the Commission for Reception, Truth and Reconciliation and of the bilateral Indonesia-Timor-Leste Commission of Truth and Friendship, including recommendations to identify victims of enforced disappearances and children separated from their families. In February 2013, the Timorese parliament began debating draft laws establishing a national reparations program for victims of abuses and their descendants and creating a Public Memory Institute to build public awareness of the history of the Indonesian occupation of the country. However, the debate was postponed and no date was set for its resumption. Today, Araujo’s government has an ideal opportunity to act decisively in combating impunity for crimes under international law and ensure that victims of past crimes obtain full access to justice, truth, and reparation. Araujo should establish a national reparations program and set up a Public Memory Institute in accordance with international standards. He should also oversee a joint comprehensive inquiry with Indonesia into the human-rights violations left unaddressed by the Serious Crimes Investigation Team. Based on the findings of this inquiry, Araujo’s government should develop a strategy for arresting and prosecuting those charged with crimes related to the Indonesian occupation. A new day has dawned for East Timor and with it comes old challenges and new opportunities. As Araujo assumes office, an overwhelming number of issues will compete for his attention. By focusing on broad-based economic growth, creating jobs, attacking corruption, reengaging international support for justice sector reform, and ending impunity for past crimes, Araujo can reduce his country’s political instability and secure the peace dividends that his people deserve.